Most Chinese pioneers to Canada came from Guangdong province in southern China. They came to the gold fields of Barkerville in the West Coast of Canada, in 1858. From 1881 - 1885, some 15, 000 Chinese railway workers were recruited to complete Canadian Pacific Railway. Like other immigrants, men went overseas in search of work and their families remained at home. 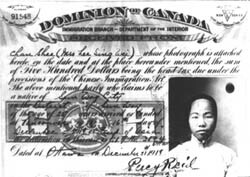 The first Chinese women to arrive in Canada came by way of San Francisco. 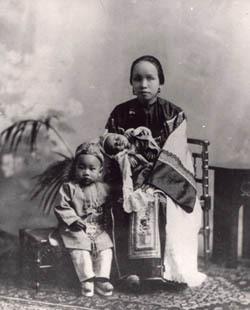 They were the wives and daughters of merchants because merchants were exempt from restrictive Chinese Immigration Acts. These Acts imposed a "head tax" on Chinese immigrants: 1885 - $50; 1900 - $100; 1903 - $500. The British Colonist, Vancouver, Vancouver Island, 1860. 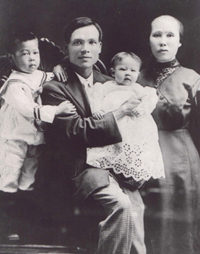 Pioneer Chinese Families were first settled in British Columbia and then gradually moved across the country. 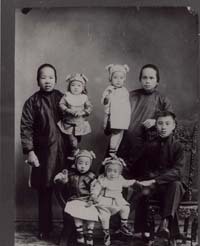 In Canada, women raised their children without the support of the extended family that life in China would have offered.